I needed six rechargeable AA cells for an old Hanimex potato-masher flash, which I bought cheap the other day to do some Strobist experimenting. I've only been buying low self-discharge ("LSD"!) NiMH cells for a while now, but I don't have six identical AA LSD cells spare at the moment, and I didn't want to drop the substantial extra amount of money to buy six more LSD cells for a flash that I'm not necessarily even going to use much. So I hit eBay, looking for the finest, cheapest NiMH AAs in the world. And I won an auction for twelve allegedly-2500mAh "BTY"-branded NiMH AAs, for 5.5 UK pounds (about $US8.30 or $AU9.30, as I write this). That one on the right didn't explode; I ripped it apart to see what, if anything, was inside. 'Cos it sure wasn't a 2500mAh NiMH cell. I didn't, to be fair, actually expect these AAs to really have a capacity of 2500 milliamp-hours. Capacity inflation is rampant in the rechargeable-battery market. Even the big brands often seem to pump up the capacity numbers a bit, and it's perfectly normal for an off-brand "2500mAh" cell to have a real capacity of only 1500mAh or so. That was fine with me, though, especially for less than ten bucks delivered. 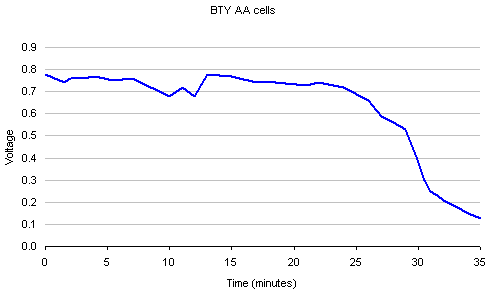 These BTY cells were much worse than I expected, though. I knew something was up as soon as I opened the package; the BTY cells are way too light. They weigh about 18 grams each, versus 29 grams for an old Sanyo 2500mAh cell, and 30 grams for a Sanyo Eneloop LSD AA. They're substantially lighter than the old worn-out 1650mAh off-brand cells still mouldering in the bottom of my Battery Drawer. My Maha C-808M charger (yours, Australian shoppers, for $AU183.15 delivered from Servaas Products) didn't like the look of the BTYs, either. It did charge them, but flashed its "battery fault" error at the end, possibly because the charge cycle was over so quickly. It was at this point that I disembowelled one of the BTYs. I was half-expecting to find a fractional-AA or AAA, or something, in there, but the casing was actually full of the normal Swiss-roll sandwich of metallic electrode and noxious-electrolyte-soaked separator. I'm not sure whether the BTYs are actually nickel-metal-hydride or mere nickel-cadmium cells; I don't think you can really tell just by looking. They certainly only have the capacity of the ultra-cheap NiCds you get in bargain-store solar garden lights, though. Aaaanyway, I filed a PayPal dispute over this, and anticipated a long and painful experience. So when I got an e-mail from PayPal the next day saying the dispute had been closed, I of course assumed that someone at eBay had decided I was ineligible for a refund because it had been three months since the dispute was filed on the 35th of Octember and I still hadn't had the batteries X-rayed by a fully licensed Federal Hat Inspector while I whistled Dixie and a five-legged elephant painted my naked body with the full ceremonial vestments of the Ecumenical Patriarch of Constantinople. But the dispute was actually closed because the seller had instantly knuckled under, and given me a full refund. And lo, searching for other people's experiences of "BTY" batteries turned up a number of reports astonishingly similar to, though blessedly less long-winded than, my own. This guy tested a range of cells and found BTYs ranked equal worst. There are people complaining about them on DealExtreme (or, at least, giving them one-star ratings). Heck, there's even a Guide post on eBay itself that warns about them. So, on balance, I'm not sure that I actually deserved to get my money back. Oh, and how did I solve my flash-powering problem? Well, the awful BTY batteries do actually power it for a little while; for longer run time, I just yanked the six-cell NiCd pack from a giant robot bug I'm not currently using and hacked up a lead to connect it to the flash's external-power-input pins. So now I can make a camera rig that looks even stupider than this! Hey, I've got that same charger. I love the fact that you just happened to have a "giant robot bug I'm not currently using" laying around like it's nothing out of the ordinary. Me: "Bugger! I need to start my BBQ but I'm out of matches!" Dan: "Well, we could use the Dinosaur-mounted flame-thrower in the shed if you like?" I am again reminded of the issue of PRC chemical "suppliers" cheerfully offering to supply dioxygen difluoride quantities on the order of a kilogram (here would be where Dan inserts that link for a second pass...). Alongside the pleasant rise of the internet shopping experience, with a billion plausible dealers, has been the appearance of a vast number of sellers who seem legit but are not. Such things are often easy to discern in a brick-and-mortar context (hint: cardboard signs with misspelled Sharpie text are a bad sign), but the equivalent for nonlocal shopping is not obvious to me. It remains, I think, the problem with internet commerce, and I don't think that's a controversial opinion. I've pretty much quit entirely on ebay and shifted to craigslist buying, in which the buyer has a lot better protection by virtue of being a discerning human withhis/her wits about them. Unless of course they get ARROW'D by the craigslist axe-murderer sasquatch. I've had a set of BTY batteries for a couple of years. Crappy they may be but they are a consistent kind of crap. They haven't got any better but no worse either. They are relegated to operating various AA powered toys for my 6yo son. Altogether not a bad thing as most of them make rather obnoxious noises and the less runtime from the batts the better. Huh...So that's what the inside of a nimh looks like. I've never seen the inside of one. I want to get a stack of LSD nimhs, but haven't talked myself into paying $5 each that they seem to go for around here yet. I should just pull the trigger and grab an auction on Trademe for $50ish for a dozen. From what people say about BTY cells on DX, it seems they are indeed NiCD. NiMH chargers often flat out refuse charging them, so someone tried popping them into a NiCD one and lo, it worked. You read the In The Pipeline post too, then, Erik? That graph roughly describes last Friday night at the pub. Alex, I've been reading Derek's blog since before ClF3 was cool! Interesting that nimh chargers would refuse to charge them. The fast charging profiles and voltages on both are basically identical. Constant current until the voltage peaks then drops then the charge is cut off. The major difference is nimh has a much smaller voltage drop at peak which is why nicd and nimh chargers aren't always interchangable. If you're doing a 1/10C charge though it won't matter other than the obviously different currents for 1/10c. Is that some 3rd party adaptall or whatever in FD mount hooked up to some sort of extension tube FD-EOS converter? Maybe even a push zoom? When NiMH was new and exciting, I think people quite commonly blew up batteries and/or chargers by sticking NiMHs into NiCd chargers. This was usually because of the voltage-drop you mention; NiCds do you the courtesy of dropping a small but readily measurable amount of terminal voltage as they go into overcharge, and that's how most "smart" NiCd chargers know when to cut off the charge. The NiMH voltage drop on charge completion is almost zero if the charge rate is low, or if the cells are hot (which they will be, if the charge rate isn't low! ), so NiMH chargers need to be more devious. NiMH cells get warm as a normal part of the fast-charge process, though, so thermal-sensor NiCd chargers will cut a NiMH charge off long before the battery's full. If you want something to fast charge from a car battery get a stack of A123s. I think it's a 4S back and a length of jumper cable for some extra resistance and you can charge them in about 3-4 minutes. :) Significantly shorten their lifespan of course, but people claim to have done it 50+ times with no measurable drop in capacity. Have you tried the NiZN batteries that the Strobist was blogging about? 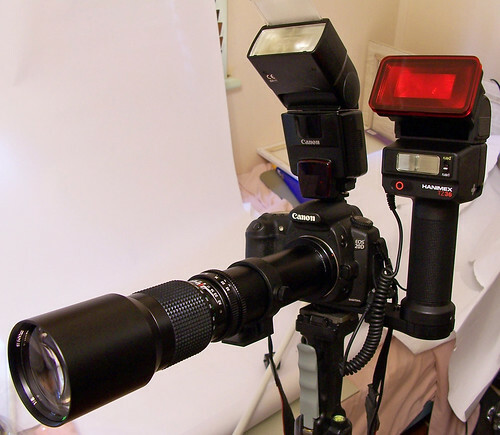 They look interesting enough to me to have a go with a set for my flash (old school Minolta 320X). I just bought 12 like these before getting the chane to do some research but didn't paid for them yet, what should i do? I asked the seller to cancel the bid but i don't think he'll be to happy about it. Any suggestions? dear friend, I was also tricked and bought these batteries too. I soon realized BTY's trick. You just see a 2500 number there. if you think twice, that's not mah it's just their model number. 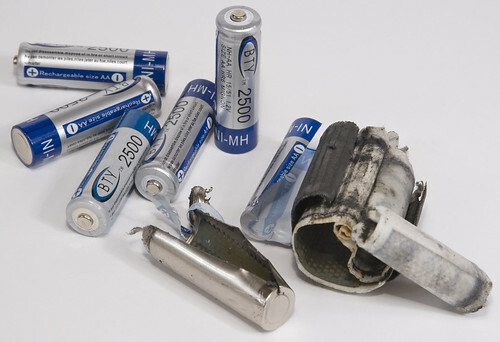 Check every photo of BTY batteries. you will NEVER EVER find a battery writing mah next to those numbers.